High Steel's AISC Certified Field Operations team has erected steel for hundreds of our projects. High Steel's AISC Certified Field Operations department specializes in steel bridge erection on hundreds of High Steel's projects, such as the Springfield Interchange in Virginia and the I-95/I-695 Interchange in Maryland. With top-of-the-line equipment and engineering staff support, you can trust our team of certified welders and ironworkers to live up to our reputation for getting the job done right. 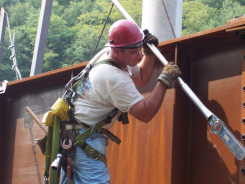 Our steel erection services are available independently or as a package on bridge projects that High Steel fabricates. The Field Operations group also independently bids on work for bridge steel rehabilitation, heat straightening of damaged girders, and other emergency repairs. Contact our sales department for a quote on your project.